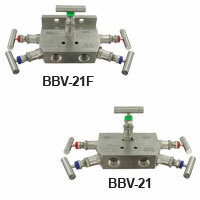 3-Valve Block Manifold can be used over a broad range of industrial applications including oil refineries, nuclear power stations, petrochemical processing, and more. 5-Valve Block and Bleed Manifold is ideal for use over a broad range of industrial applications including oil refineries, nuclear power stations, petrochemical processing, and more. Designed to withstand repeated open and close operations. 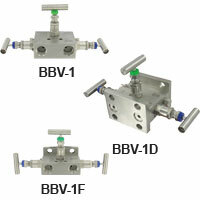 2-Valve Block Manifold is for use over a broad range of industrial applications. Designed to withstand repeated open and close operations. Suited to control oil, water, toxic fluids, chemicals, air, and steam.